The Roush Automotive Collection is pleased to announce the second Open House event scheduled for the 2018 summer season to be held on Thursday, June 7th from 5:00 p.m. until 8:00 p.m. The first 350 people will receive a free Drawstring Goodie Bag! Activities planned for the Open House event include a Roush Fenway driver autograph session, car cruise-in, Roush Clean Tech Tour, RPP tour, drag race simulator, mustang pinball machine, 97.1 the Ticket Prize Cube, door prize drawings, and an engine build competition. 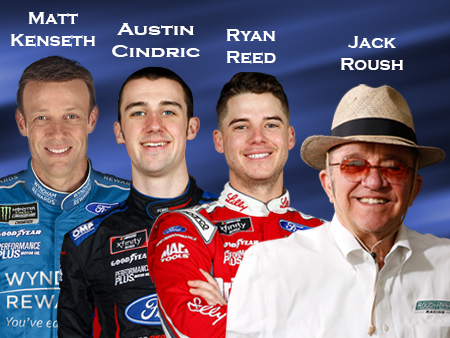 NASCAR Xfinity Series drivers Ryan Reed, Austin Cindric and Monster Energy Series driver Matt Kenseth and team owner Jack Roush will be on hand to meet fans and sign autographs from 5:30 pm until 7:00 pm. Autograph session times and appearances may be subject to change. Please call the Event Hotline for details at 734-779-7276. This event is free and open to the public. Autograph session line procedures: There will be two lines. Jack Roush will be in Line 1 that requires a wristband. Ryan Reed, Austin Cindric and Matt Kenseth will be in Line 2 that requires a wristband. Choose 1 of the lines to receive a wristband for. For this event only: If after you get through the line and there are still wristbands available for the other line you may then get another wristband from the other line. Limit 1 item per driver. Limit 1 item for Jack Roush. Wristbands will be passed out beginning at 4:30 pm to those in line. 50 wristbands will be passed out for Line 1 and 100 wristbands for Line 2. (150 wristbands total). You MUST have a wristband to receive signatures however wristbands do not guarantee signatures. There is no cost for the wristbands or the autograph session. Line procedures may be subject to change. Don’t miss your chance to tour two of our Roush facilities! We will be offering tours of Roush Clean Tech and Roush Performance throughout the day. Sign up for the Roush Clean Tech tour for a behind the scenes look at our alternative fuel vehicle conversion facility or for the Roush Performance tour to see firsthand what goes into producing a Roush Performance vehicle. Our shuttle vans will leave from the Roush Collection at 10 am for the Roush Clean Tech tour and at 1 pm for the Roush Performance tour. Tours are limited to the first 20 people for each time slot so reserve your spot on the shuttle. Please Pre-Register for the tours by calling 734-779-7290. The Roush Automotive Collection Retail Store & Museum will be open from 9:30 am – 8:00 pm for your shopping needs and for free self-led tours. Come early & get what you need for the autograph session or to walk around the museum. A selection of authentic race car parts are available for purchase. Treasure hunters will find race car body panels from the NASCAR ROUSH Fenway teams. A drag race simulator will also be available to test your reaction time. See if you have what it takes to be a drag racer. Try out our new Mustang pinball machine: 50 cents for 1 play and $1 for 3 plays. Stop by the 97.1 the Ticket prize cube for a chance to win cool prizes! A series of door prize drawings are held throughout the evening. Drawings will be held at 6:30 pm and 7:30 pm. Door prize give-aways include a pair of MIS Grandstand seat tickets for the FireKeepers Casino 400 on June 10th 2018. Additional door prize give-aways include a variety of ROUSH Fenway memorabilia. Contestants must be present to win. One entry per person per night. Free to enter! Multiple entries in door prize drawing will lead to disqualification for all prizes. Two teams from the ROUSH Engine Build Department will compete side-by-side to see who can execute a complete engine build-up, including a live test run, in the quickest time. With all this fun you’ll be sure to work up an appetite, a local vendor will be on site selling hotdogs, chips, nachos, ice cream, pop & water.